Accessibility isn’t a new concept. Hearing health care professionals break down barriers for people with hearing loss every day. Whether it’s recommending or fitting hearing adaptive technology, educating the public, or meeting with government officials, we all strive to be stewards of accessibility. According to Statistics Canada, nearly 15% of Canadians over the age of 15 identify with having some form of disability, whether it’s related to hearing, vision, mobility, memory, mental health, or something else. What’s more, three-quarters of Canadians with disabilities have more than one disability. People with disabilities want to participate and engage in society equally with their non-disabled peers; they want to learn at the same schools, shop at the same places, participate in the all aspects of the economy, and enjoy online interaction. And why shouldn’t they? This is a fundamental right! The issue of accessibility is an important topic globally and has been garnering much public attention. Over the last few years, we have been seeing a greater dialogue and action in the area of accessibility, right here in Canada. As a result, the Canadian Academy of Audiology (CAA) is introducing this special issue of Canadian Audiologist, dedicated solely to issues surrounding access. But how did we get to where we are and the laws that are being introduced and how do they impact our professions? More importantly, what can we do to ensure that Canada remains barrier-free to everyone, including people with hearing loss? This issue of CanadianAudiologist.ca touches on how we are putting accessibility into action in Canada and draws attention to some of the areas that need improvement. In Canada, issues of labour, education, health, and accessibility can be both federally and provincially regulated, and consistency between federal and provincial regulations, accessibility has been generally covered under the Canadian Charter of Rights and Freedoms, the Canadian Human Rights Act, and through various human right laws at the provincial level. At the same time there has been a movement to develop and adopt accessibility and inclusion issues through legislation to enhance what protections are already in place and to ensure that accessibility and inclusion is being addressed directly. The most widely known piece of accessibility legislation in Canada is the Accessibility for Ontarians with Disabilities Act (AODA), that was introduced in 2005 by the Government of Ontario. The purpose of the AODA is to develop, implement and enforce standards for accessibility related to goods, services, facilities, employment, accommodation and buildings, making Ontario fully accessible by January 1, 2025. Since the enactment of the AODA, a number of other provinces in Canada, such as Manitoba and Nova Scotia have followed suit and introduced similar legislation. More recently the Government of British Columbia announced that it too will be developing legislation to ensure accessibility. In other jurisdictions, disability rights advocates are putting pressure on their governments to put such legislation in place. In the spring 2018, the Government of Canada introduced its own accessibility legislation, Bill C-81: An Accessible Canada Act (Bill C-81). 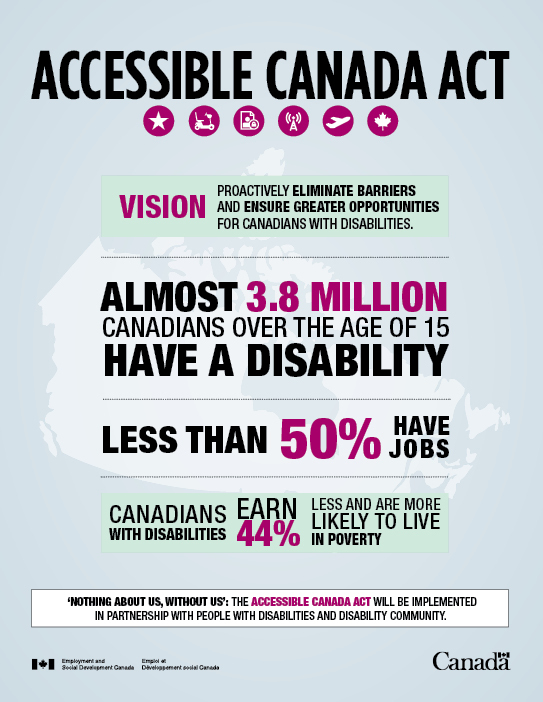 This legislation was a commitment made by the Liberal government during the 2015 election and it promised to proactively eliminate barriers and ensure greater opportunities for Canadians living with disabilities. I believe one of the most impressive elements about Bill C-81, is the extensive consultation process with the disability community which the government undertook in its development. The Canadian Hard of Hearing Association (CHHA) has been working tirelessly to remove barriers for people with disabilities. Together with the support of our coast-to-coast-to-coast network, CHHA with partner organizations including the Canadian Academy of Audiology (CAA) undertook a 2-year consultation process through its “Spotlight on Invisible Disabilities” project. This initiative sought perspectives of youth, seniors and veterans with non-visible disabilities on issues relating to mental health, learning disabilities and hearing loss from across Canada. At the conclusion of this process, CHHA developed 15 priority recommendations and five focus areas, including ways in which legislation could put the recommendations into practice and how to measure the success of its outcomes. The final report was submitted to the Government of Canada for its consideration to inform the development of Bill C-81. We were pleased to see that many of the recommendations we provided were adopted in the draft legislation. You can read the detailed reports for Spotlight on Invisible Disabilities on the CHHA website. 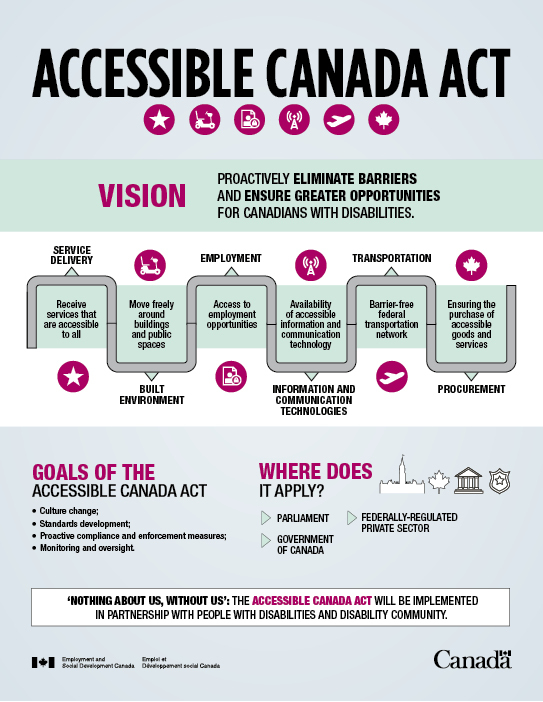 Once passed, Bill C-81 would provide the Government of Canada, under the newly formed Chief Accessibility Officer, the authority to work with stakeholders and Canadians with disabilities to create new accessibility standards and regulations that would apply to sectors in the federal jurisdiction, such as banking, telecommunications, transportation industries like air and rail, and the Government of Canada itself. These new regulated standards would set out requirements for organizations to follow in order to identify, remove, and prevent barriers to accessibility. At the time of publication, Bill C-81 has been passed by the House of Commons and is currently being reviewed by the Senate. The Senate is expected to review the legislation in February and meet with stakeholders for its feedback. 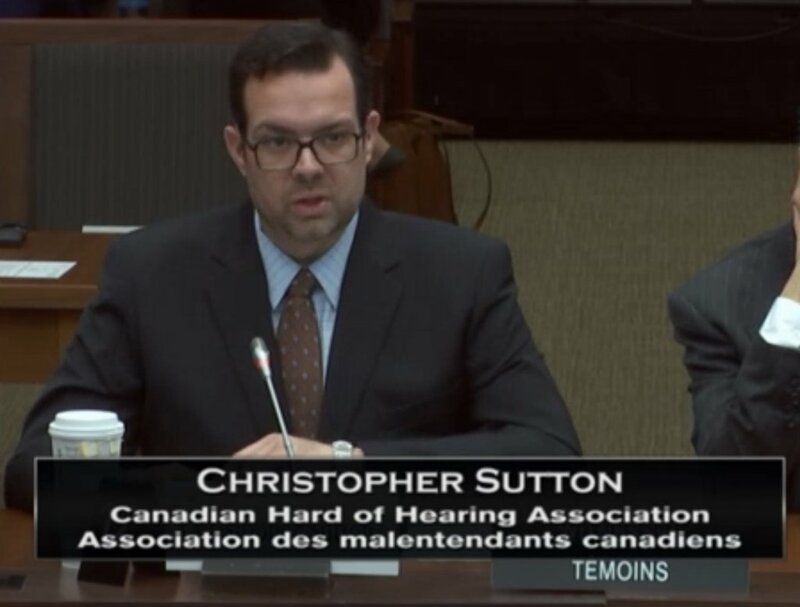 CHHA was very honoured to be part of a similar feedback process when the legislation was being reviewed by the House of Commons and was invited to appear before the Standing Committee on Human Resources, Skills and Social Development and the Status of Person with Disabilities. During this testimony, members of CHHA congratulated the Government of Canada for its work on developing this legislation and the process in which they took to consult with people with disabilities to ensure that the legislation meets our needs. CHHA also took this opportunity to bring attention to the rising numbers of people with hearing loss, and the associated economic burden which poses a cause for concern, globally and in Canada. CHHA noted that hearing loss has rarely been an issue that has captured public support and while there have been some strategies for hearing care implemented in some provinces across Canada, awareness and resource allocations for hearing healthcare remain scarce. This is concerning, as unaddressed hearing loss puts affected Canadians at significant risk for underemployment and developing other serious conditions such as depression and anxiety that will add further costs to the healthcare system. Since this presentation CHHA and our partners have been able to meet with a number of elected representatives to discuss these issues. Over the next few months we expect much work to be done before the passage of Bill C-81 and are asking you for your support. We want to ensure that you are up-to-date and informed about this legislation and encourage you to check the CHHA website www.chha.ca so you can learn how you can support this important work and ensure this legislation is passed before the next general election in October 2019. Together we can build a barrier-free Canada!